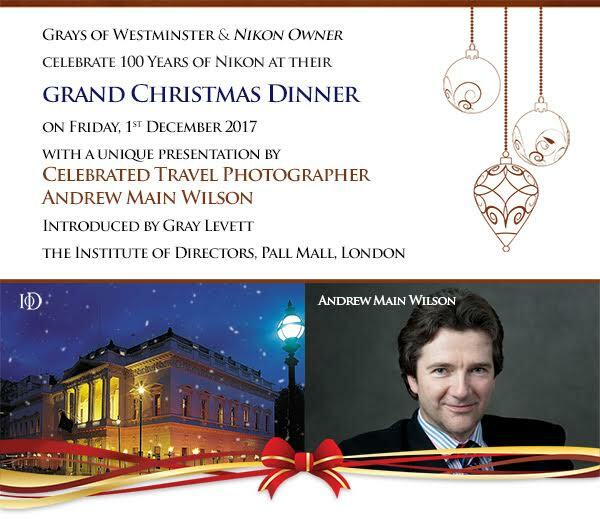 Grays of Westminster and Nikon Owner magazine would like to invite you to their grand Christmas Event in the magnificent Regency Restaurant at the Institute of Directors (IoD), 116 Pall Mall, London. The champagne reception and superb Christmas dinner will be followed this year by a unique presentation by Andrew Main Wilson who has set out to become the first person to visit every country in the world and tell the story of the 1,000 greatest travel experiences on Earth in images and words. 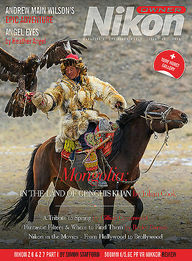 With photographic shoots in 175 of the world’s 200 countries now complete, he is very close to finishing his global odyssey. 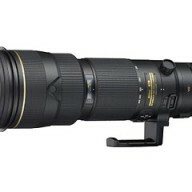 The images from all 175 countries have been shot using Nikon cameras and lenses, from the Nikon F4 to the Nikon D800, and the 14-24mm to the 80-400mm Nikkor zoom. Inspired and influenced along the way by interviewing world leaders such as Archbishop Desmond Tutu, Sir David Attenborough and Astronaut Buzz Aldrin, Andrew Main Wilson will share his exciting stories and the iconic images of his epic adventures across the globe. The Institute of Directors is a grand Grade I listed Regency building and its sweeping marble staircase and vast walls, covered in 18th and 19th century canvases, provides a spectacular backdrop for the evening; the period restaurant at the IoD is a most fitting venue for this elegant celebration. Andrew Main Wilson’s Presentation in the Morning Room: 9.15 p.m.
To book a place at the Christmas event, please reply to me, Gillian Greenwood, on gillian.greenwood@graysofwestminster.co.uk with your full name, Nikon Owner user-name if available, postcode, daytime mobile or landline, your menu choice (traditional or vegetarian) and the name of any guest or guests you would like to bring with you. We are unfortunately unable to take telephone messages with regard to your booking. As there are only a certain number of places available, may we also ask you to reply as soon as possible. 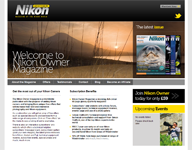 If you are not a current Nikon Owner subscriber, you are welcome to join or re-join Nikon Owner when we contact you to receive the benefit of booking the Christmas Event at the lower price. 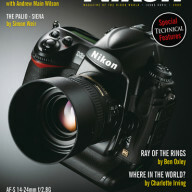 · Substantial discounts on a number of training sessions, workshops, seminars and safaris. 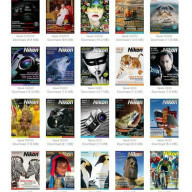 These include Simon Stafford’s all-day photographic workshops (which he arranges in addition to his Flash, Portraiture, Macro and kit-related courses), Michael Eleftheriades’ Lightroom and Colour-Calibration seminars as well as his London Walks and ‘How-To’ Seminars, Graham Eaton’s wildlife workshops and events.